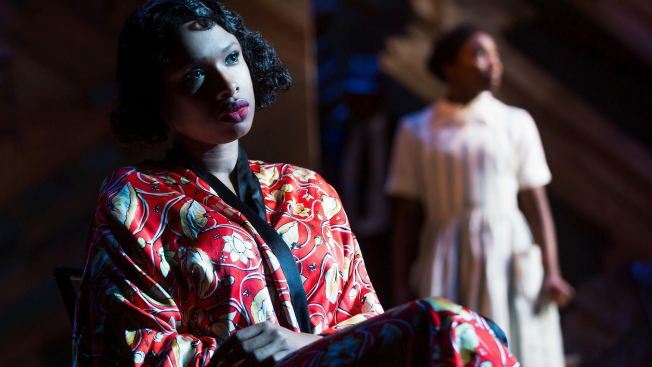 Jennifer Hudson as Shug and Cynthia Erivo (background) as Celie, in John Doyle's staging of "The Color Purple." Below, Danielle Brooks and Kyle Scatliffe, as Sofia and Harpo. The colors in “The Color Purple” are few and far between: some African cloth, Shug’s technicolor dresses and the pants sewn by Celie, the story’s heroine, once she comes into her own. For the most part, all the costumes are sepia-toned, and the set consists of only ragged brown planks and wooden chairs, surrealistically suspended on a wall and later to become props. Such minimalism is the hallmark of director John Doyle, who previously brought it to “Sweeney Todd” and “Company,” and now takes on the 2005 musical based on Alice Walker’s novel about a poor black girl growing up in early 20th century Georgia. His stripped-down revival has just opened at the Bernard B. Jacobs Theatre. The limited staging (a major difference from the original Broadway production a decade ago) puts the focus on the score, by Brenda Russell, Allee Willis and Stephen Bray. Jazz, ragtime, gospel and blues are represented. A trio of supremely talented women all making their Broadway debuts do most of the singing. Cynthia Erivo is outstanding as Celie, the stoic young girl who is raped by her father and bears him two children, only to see them ripped from her arms. At the performance I attended, Erivo brought the house down with the life-affirming song “I’m Here,” at the end of the tight second act. A Greek chorus of gossipy women represent the way farm and village life closes in on Celie, while Shug Avery (Jennifer Hudson) and Sofia (Danielle Brooks) help her see that she has the inner resources to escape it. Hudson gives us a steamy and satisfying Shug, the “queen honeybee” nightclub singer. The “Dreamgirls” Oscar winner gets out of the way of the story and the other actors, in what is truly a supporting performance -- her drunken entrance, part way through the first act, hits a dramatic note without stealing thunder from Erivo, the show’s real star. I wish Hudson got to sing more, but we settle for small pleasures like having her twirl and tease through “Push Da Button,” set in Harpo’s juke joint. The intimate relationship between Celie and Shug is handled here both tenderly and directly. When Shug arrives at Celie and Albert’s home with another man in her life, we feel and understand the coolness coming her way from both of her jilted lovers. Brooks (Tasha “Taystee” Jefferson, on “Orange Is the New Black”) and Kyle Scatliffe, as on-again, off-again lovers Sofia and Harpo, deliver particularly strong performances. Their second act duet, “Any Little Thing,” is a grinding, groovy delight. Scatliffe’s Harpo seems to have a core of common sense, rather than just being a lemming at the mercy of his father and the various harridans in his life. He’s as believable as a match for Sofia as he is the older son who finally stands up to his father. Nasty as Isaiah Johnson is as Mister, he’s a pussycat to wife Celie and son Harpo compared to Danny Glover's character in the Steven Spielberg film. While this script doesn’t exactly cast “Albert” (as only Shug may call him) in a better light, it does give him more room as matters conclude to make amends. This production, as buoyant and vital as can be, premiered at London’s Menier Chocolate Factory in 2013. Walker’s novel and Spielberg’s movie appeal to a myriad of senses -- I can still hear the loud crack made by Shug’s breakfast plate when the singer, disapproving of Mister’s culinary efforts, sends it flying into a hallway wall. Broadway’s latest incarnation focuses almost entirely on song, but it’s still the same joyous and uplifting journey. “The Color Purple,” with an open-ended run at the Bernard B. Jacobs Theatre, 242 W. 45th St. Tickets: $75-$145. Call 212-239-6200.